Height: Over 10 in (25 cm) and under 15 in (38 cm) at the shoulder. There are several theories of the Poodle’s origins and, while it is regarded as the National Dog of France, the breed’s actual roots may have come from Germany where he is known as the Pudel or Canis Familiaris Aquatius. The breed is also known as the “French Poodle” and the “Caniche.” The Standard Poodle‘s original popularity was largely due to his fame as a Water Retriever. Ancient Egyptian and Roman artefacts depict the Poodle’s ancestors assisting their masters as game nets are brought in, retrieving various game from marshes, and herding animals. 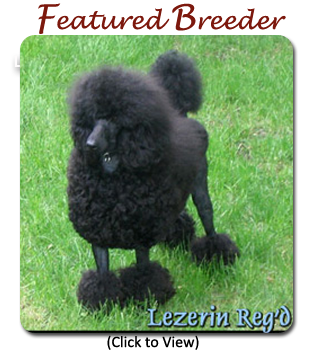 The Poodle is said to be related to the Portuguese Water Dog and the Irish Water Spaniel. Hip Dysplasia — Hip Dysplasia is a conditon in which the head of the femur fits improperly into the hip joint socket and is a common hereditary disorder found in many large breeds. Hip Dysplasia has also been seen in the Miniature Poodle and screening is recommended for breeding stock. Legg-Calve-Perthes — This disorder results when the blood supply to the femoral head is interrupted resulting in vascular necrosis. The OFA recommends that dogs affected with LCPD not be used in breeding programs as it is believed to have a genetic mode of inheritance. A new OFA health database specific to Legg-Calve-Perthes is available. Patellar Luxation — This is the dislocation or slipping of the patella (kneecap). Signs include difficulty in straightening the kenn, pain in the stifle, limping, or the tip of the hock points outward while the toes point inward.